Prof. K. Nakajima's lab. (Crystal Physics), Assoc. Prof. Hayashi (Chemical Physics of Non-Crystalline Materials) and Kyoto University group have successfully developed two types of X-ray crystal lenses, which can realize industrial-strength X-ray apparatuses. These lenses were fabricated using their hot deformation technique, which can form a Si or Ge crystal into an arbitrary 3D shape. 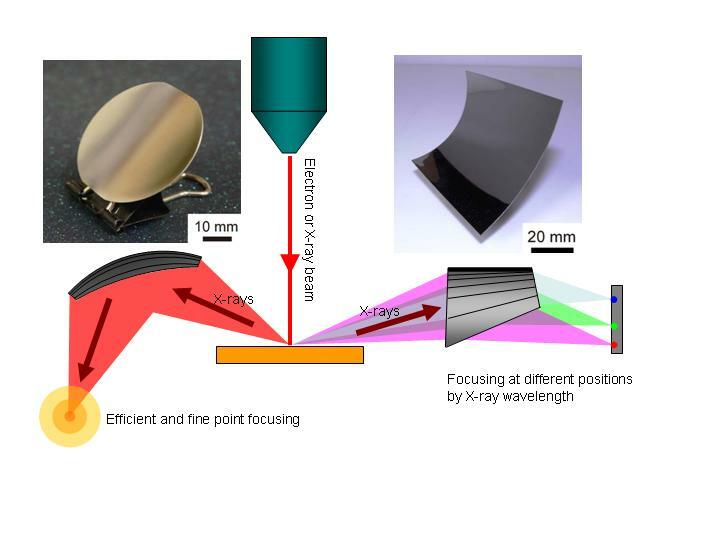 Applying these lenses to commercially available X-ray sources, we can obtain X-ray beams over one hundred times stronger than those from conventional X-ray optics. This feature enables us to carry out a real time X-ray analysis in in-house experiment, like experiments at huge synchrotron radiation facilities, such as SPring-8, and this will assist the understanding of chemical states during some reactions of materials. This work was performed as a part of the Programs of Japan Science and Technology Agency (JST) "Development of Systems and Technology for Advanced Measurement and analysis". The research achievement was published in the Japanese Science Journal "Appl. Phys. Express" on March 19, 2010, and was presented at the 57th Spring Meeting of the Japan Society of Applied Physics. Moreover, it was broadcasted in Miyagi TV news program (March 30, 2010), and was introduced in Kahoku Shimpo (April 1, 2010), Kagaku Shimbun (April 23, 2010).